Conselheiro VR Smart Grid é uma ferramenta profissional para negociação na grade de ordens em instrumentos financeiros. O algoritmo do programa é organizado de tal maneira que o orientador usa o sinal não do preço atual, mas do preço do canal. Um algoritmo especial calcula o canal e a faixa de preço por analogia com o canal Donchian e gera sinais com base nele. O código especial processa o canal, construído de acordo com os altos e baixos dos últimos períodos, na busca pela direção da tendência. Type trade - O tipo de trabalho do consultor, pode ser uma das sete opções. Only buy orders - o Consultor negocia apenas com ordens de compra, os sinais de venda são ignorados, o uso eficiente do modo com uma tendência de alta. Only sell orders - negociações de Consultor apenas ordens de venda, sinais de compra são ignorados, uso eficiente do modo em uma tendência de baixa. Stop trade buy orders - O Consultor interrompe a negociação de ordens de compra, efetivamente usado em uma tendência de baixa para interromper as compras aleatórias. Stop trade sell orders - O Consultor interrompe as ordens de negociação para venda, efetivamente usado em uma tendência de alta para interromper as vendas aleatórias. Stop trade - Auto trade - O Advisor interrompe a negociação. Manual trading - O consultor fornece ao comerciante um menu de trabalho com uma rede de pedidos. Devido a este modo, o trader pode especificar manualmente para o consultor em quais preços fazer negócios usando linhas de tendência. As linhas podem ser esticadas em uma tendência, contra uma tendência, horizontal e verticalmente. Linhas podem limitar a zona de entrada no tempo. Type Averaging - O tipo de pedidos de média, pode ser uma das três opções. All orders - Todas as encomendas por tipo, ou apenas ordens de venda ou ordens de compra. Two orders Maximal and Minimal - O modo em que duas ordens são calculadas, a ordem mais não lucrativa com o volume mínimo e a ordem mais recente com o volume máximo. Esse modo incomum permite reduzir parcialmente a rede de pedidos e, assim, aproximar o valor do take-profit do preço atual. É importante observar que o modo começa a funcionar apenas se as ordens do mesmo tipo não forem inferiores a quatro, até esse número o modo Todas as ordens funciona. No averaging - Averaging não é usada. Este modo é eficaz em conjunto com uma parada móvel e negociando uma tendência. Trailing Stop - funciona se houver mais de zero, um trailing stop clássico. 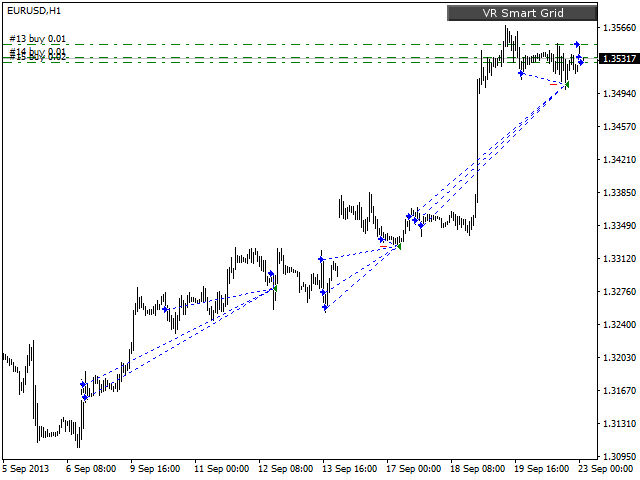 Trailing period - Funciona se houver mais de zero, trailing stop no canal do algoritmo de sinal principal. Up lot + Dw lot - Cada lote subsequente é igual à soma dos lotes dos pedidos máximo e mínimo. The profit from the partial position closure - Um modo adicional de reduzir a posição no mercado. Если настройки правильные - то советник отличный. Хорошее отношение профита к риску. Its a very flexible EA, so you need to spend time watching and understanding its behaviour. After its much easier to think and find a way to make money. Also, the owner is attentive and willing to improve his product. Blew my account, very dangerous. backtest and real account behavior very different. I am testing the EA for a week now with 100,- € Starting Balance and Lot 0.01 on a real account. Till now 30% Profit with max. DD 16%. It is a good performance and a really good EA. Of course you must understand how the Grid System work and how you trade with. At the moment I give "only" 4 stars, because the support of Author could be better. Update 12.04.2019: I give 5 stars now! I am using VR SG since 2 weeks and the profit is at 65% with 20 % DD. Account Balance now at 165,- €. This is really good and till now safe performance! And I noticed, that Vladimir is working on a new MT5 Version and making better his great EA. I appreciate that. So I can understand, that he can't replay all questions. Because of that thanks to the experience Users in the Community who are always willing to help new Users! Awesome! this is a crap EA,i wonder where these people get all these 5 stars from,this EA will blow your account test it and you will see and the seller doesn't even respond to messages,bad support bad EA.stay away. I am very satisfied, my losses and profits have been the result of a bad and good configuration respectively, we would all have to understand very well how the expert advisor works and perform the tests as many as necessary to understand each parameter, I do not consider myself an expert and I learn from all, and I would never blame others of my configuration much less to the author to whom I thank all his effort to improve the adviser. День добрый. Уважаемый автор, скажите, а можно такого советника сделать для МТ5? Maybe it's a bit too early to give a realistic rating, but the SG recorded 500 Euros within 3 days. Start Lot 0.04. Crazy. I will renew my rating after one month. The best EA I've ever used! It's a powerful tool for trading! Thank you Vladimir! Works very nicely, I'm happy. The author isn't cooperative and also I didn't find the real monitor account. Шикарный робот - для умных,не жадных людей ! Я Сам долго следил перед покупкой - положительных отзывов только прибавлялось точно не зря ! Считаю что очень выгодно его купил,автор его постоянно развивает - стоимость однозначно со временем уверен будет больше ! Негативные отзывы пишут - глупцы,не обращайте внимания !!! For those who buy it, keep in mind, do not need to chase a huge profit! As Vladimir once said, "for hotheads, keep in mind the advisor can drain the deposit." It is definitely the best EA I have ever used. So far So good !! With manageable drawdown less than 20%. It work as a money printing machine, thanks to it's averaging strategy..
My only concern was when a big spike comes from nowhere, what does this ea will do?? Does it open new opposite position to contain losses?? Or we have to wait till all things settle down?? Владимир, огромное Вам спасибо за советника! Как уже однажды Владимир сказал " для горячих голов имейте ввиду советник может слить депозит". Я горячая голова! Я установил советник на 7 валютных пар в максимальных для заработка условиях. В результате на коррекции 7 пар потерял 200$ из 500$. После того как я увидел работу в максимальной нагрузке, я выставил настройки в минимальной нагрузке на депозит, и на каждой паре советник зарабатывает минимум 30-50$ в сутки! Еще раз огромное Вам спасибо Владимир! Советник просто супер!!! С НОВЫМ обновлением советник стал еще круче! Тем кто его купит имейте ввиду, не нужно гнаться за огромной прибылью! Настройки позволяют с минимальной посадкой заробатывать! Доказательства что советник работает при правильных настройках идеально могу любому предоставить! Если есть вопросы по тому как именно я настроил и зарабатываю с этим советником, пишите мне в лс. A piece of Junk, please do not spend money on these Robot.Those reviews with 5 stars are not real.If u want to see that I'm not kidding test it on demo!You'l not gonna see your money back! I'm so happy. Super Good EA,perfect support. EDITED: Respond is a bit slow by author but i do understand because he is facing not only me and he is working on the EA, so be patient to get reply. This EA works really great, even though it is not make a huge profit but stable profit, even news is coming I don't care just let the EA do it is job. This has got to be the best EA I ever used. It generates steady profit, 5 days a week. Purchased in Feb. Been running on two MT4 live accounts. 20% gains on both accounts. Thanks Vladimir for a very smart grid. With 40 usd initial balance (for testing), i got 70USD just in a day. Amazing EA, use with caution. EA just a tool, u r the king. Thank you Vladimir! Most disappointing experience, after testing set files put ea on a 10K account, so far 10.25 profit and for week 2 1125 in DD with 0.01 lot size start. You have to have patience with Grids and their set file. Nice job Vladimir, keep up the great work and can't wait for new updates. Really flexible EA with many settings. Great work!! With proper settings and right money management this EA is an incredible instrument in your trading ! Good job Vladimir. EA is very good. Great EA! Have been using it for 3 weeks with over 70% profit so far! EDIT: After 4 weeks, 167% profit! Amazing EA! The best EA on the planet! Money Making Machine if you know how to use it! Salute to Vladimir the creator and Peter for the settings and relentlessly ongoing improvements for the community! Thank you so much! Great EA. One of the best EA's I have seen thus far. I finally found it already, really a great ea, very thank to Vladimir Pastushak! I'm learning about the EA for now, but it seems very promising! Keep the great job VP! im strategietester läuft gut und werde noch im demokonto weitertesten!!!! One of the best EA in my life which provide me stable profitable result. Really thanks Vladimir and also Peter's idea and all any comments explanation. Start with rent the EA one week ago. EA managed well all news untill now. Close every day with profit. Quiet impresive. So far so good..making good small profits daily on a small account. one of the best EA I have tested so far, and a great and helpful community especially peter for helping out new comers. Great EA with a lot of different settings and great support from author and community. Very good EA. Try on demo and real account, this EA gives constant good profit. Special thanks to author and Peter for excellent contribution. Good EA with great potential. Using 1h default setting, will leave positions always open. Have to use shorter time fame to close open positions. Vladimir has been actively in support and improving EA capability. Good Profits on real account and great support from author and community.. This is the only EA that makes me profit so far, with great help from the community hopefully we can grow together. VP the author takes time to continually update this EA to meet growing development in the market, makes this EA even more valuable. This EA is very good. Demo for 15 days and so far have been profitable gains. Have go live account. So far is profitable gains too. Special thanks to Peter Fei for his parameters too. Vladimir had also been very helpful with support. Superb EA! Best support from the creator and from the community. Thank You for this opportunity. After years of trading, never really finding a style that suits me I am so pleased to have found this EA. It is simple to understand and simple to adapt to your balance and margin. There are numerous combinations of settings to suit your needs and allow for the ever changing market.It has so far given me a steady profit with very little stree. Thankyou VR for all your hard work on this EA and for listening to requests for additions to the EA, really looking forward to the update to make the software even better! Peter, thankyou for being the guru on this expert advisor and for being there to guide people through it. You are always very helpful and courteous. 1. The consistency of the VR Smart Grid EA. 2. The low draw-down and good money management. Now I can trade without my blood pressure rising about loosing my funds. Keep up the good work VP and keep the updates coming. very good EA!Thank you Vladimir! And also thank you Peter and Cliphton for your great contributions. It is truly an EA that even a newbie can use and profit from. Please read through all comments to learn the basic mechanism and to learn how to get out of tricky situations. Peter has been a great help to this community. Thank you Vladimir for your hard work. Peter you have truly directed everyone to a gem! One of the best Grid Algo ever! Don't be greedy, money management is important and know your leverage. Check the market movement and trend.. The best and smart EA. This EA should take first place in the market. Much better than all other expensive EA in the market. There is potential... requires testing and optimisations to discover best settings for use. Vendor has done much work. Now much work required by user before using Live. Awesome EA! Find your right settings. Don't be greedy and build up your capital step by step. The key is not to loose money. Be happy about every profit whether it is much or not. Thank you Vladimir! And also thank you Peter and Cliphton for your great contributions. Great and reliable EA. Yes. This EA is smart!. Thank you Vladimir. Прекрасный советник. Выдержал все мои тесты не только на валюте но и на европейском индексе. В реале приносит стабильный доход, без усреднения лота. Если использовать усреднение, то постоянный контроль обязателен. Автору большое спасибо за продукт и компетентную поддержку. Which currency pair and which time frame please. the best only the best, thank you Vladimir for this great work. you have to know how to use it and study. After that, do not be greedy. Great EA with a lot of different settings, but still a Grid logic….. so please Don't be greedy!!! On top the Community is also very helpful!!! Good job Vladimir!!! Consistent profit. EA works great!!! I like it! Best EA that i have ever used! Many thanks to author! Start from 20 Dec with 1500USD deposit, 400USD profit at 28 Dec.
And this EA provided flexibility to meet the different situation. My turn to give thanks. Potentially a great place for social and like minded friends to learn and exchange ideas! Do fiddle and find your personal threshold for drawdown and timeframe and capital to start up. Im thiking of combining author’s 1hr and my 1min set. One to work as short term and another as mid/Long term. Sorta like, two strategies running. And mitigate and spread risk. Superb EA I ever use, I really love it. this is the best program for making steady income, if you can use this on 1:500 ecn account you can use bigger lots, and the money will blow your mind, no need for work just sit back and see the profit !!!! just keep an eye out for news on heavy trend days. Vladimir you have done an excellent job !! keep up the good work !! 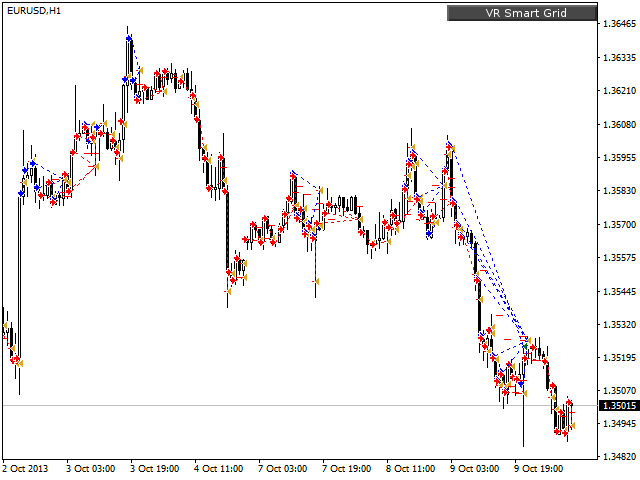 Hi Vladimir, can you give me a preset for EURUSD and EURGBP. One more thing, what´s that magic number for? I couldn't find information about it. Backtest looks amazing! This is the type of scalper i have been looking for! In the market all the time! The code is fully optimized and accelerated. Improved work with the balance of the adviser and the distribution of profits. Advisor Balance - added a warning about the negative balance of the adviser. The program is completely rewritten from scratch! Before updating, be sure to test the program on a demo account! Time to stop trading, the expert does not open new orders, but at the same time controls and modifies previously opened orders. The setting is useful for situations when a broker at night can raise security requirements. In some cases, the EA did not correctly calculate the profit and closed one order with a loss. Fixed the issue with Magic numbers. Earlier, changing the magic number during in the process of operation could lead to opening numerous orders. Description of the program in the dialog box. Added information about the program to a special window. Speed of operation with a large number of orders.